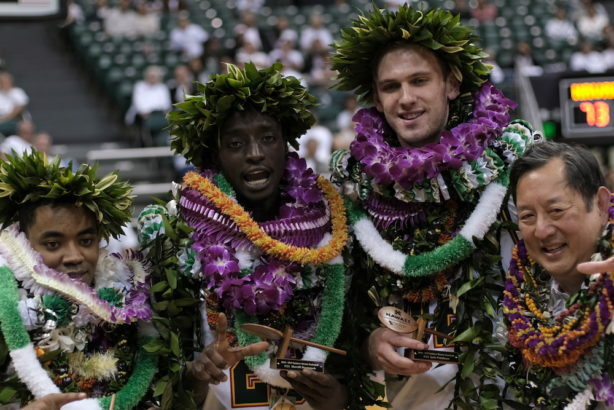 Tickets are still available for the University of Hawai’i basketball team’s annual awards banquet, which is set for April 17 at the Hilton Hawaiian Village Coral Ballroom. No-host cocktails begin at 5:30 p.m., with dinner and program to start around 6:30 p.m. The banquet is a celebration of the 2018-19 season, as well as a fundraiser for the UH basketball program. Proceeds from banquet will go towards summer school scholarships for men’s basketball student-athletes. Tickets are $100 per person, which is a lower price than offered in previous years. A “Fan Table” can also be purchased for $1,500, and it includes 10 seats and 10 drink coupons. A “Warrior Table” can be purchased for $2,000, and it included eight seats (plus two players and/or coaches from the team), 10 drink coupons and four hosted parking. Reservations are recommended to be made by this Wednesday, April 10. The Rainbow Warriors recently completed an 18-13 overall season, which included a fourth-place finish in the Big West Conference. Leland Green transferred to D2 team Humbolt State. We played them in the Outrigger Rainbow Classic last November and beat them 90-54. Aloha and welcome to #PrideRock @JuniorMadut!